Gaslamp πλατεία της πόλης! Αυτή η μονάδα βρίσκεται στην καρδιά της περίφημης συνοικίας Gaslamp του Σαν Ντιέγκο. Πολύ ευρύχωρο ανοικτό σχέδιο ορόφων. Μετρητές Γρανίτης σε κουζίνα και μπάνιο, συσκευές από ανοξείδωτο ατσάλι. 2 τετράγωνα μακριά για να Συνεδριακό Κέντρο (2 λεπτά με τα πόδια). Δείτε το καλύτερο του Gaslamp στο κέντρο της πόλης σε κοντινή απόσταση με τα πόδια από την εξέδρα, Horton Plaza, Τρόλεϊ, συνεδριακό κέντρο, μπαρ και εστιατόρια. Εστιατόρια σε κτίριο στο επίπεδο του δρόμου περιλαμβάνουν: BiCE, και το The Oceanaire Θαλασσινά δωματίου. Οι παροχές περιλαμβάνουν: πισίνα, υδρομασάζ, γυμναστήριο, WiFi και Πλυντήρια & μαλλιών, περιφραγμένο και υπόγειο χώρο στάθμευσης. Θα απολαύσετε έχοντας θρυλικού εστιατόρια, νυχτερινά κέντρα, μπαρ, συνεδριακό κέντρο και πάρκο Petco σε κοντινή απόσταση από το Adobe σας! Clean, comfortable, and close to everything--transportation, sights of San Diego, food. was a patio area with Grills, tables, etc. The grills were maintained on a daily basis. Noise was not a problem. Would recommend this location. The condo was equipped with a washer and dryer, dishwasher, full kitchen. South windows allowed the sunshine in which was wonderful. Property is exactly as viewed. We enjoyed our stay in San Diego. 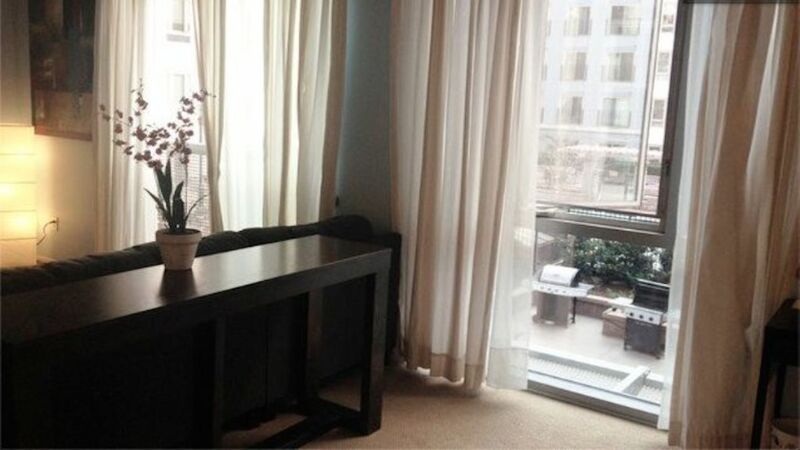 This property is ideally located in the Gaslamp district, and the building assures safety. We also appreciated the parking situation. As noted before in other reviews, we had a bit of a problem adjusting to a Queen bed, but that was our problem. The condo is clean, and we loved the wood floor. This is the perfect location in SD. I lived in this building 10 years ago and totally loved it. It is still a new and well managed home for many downtown residents. There is nightlife, harbor walks, tourist activities, trolley access, shopping, and in-season MLB within a 3 block safe radius. Oh yeah, a little convention center right down the block. Yes, downtown condos are small but you are rarely inside. This one is situated on a large inside peaceful courtyard with the glamour and excitement of major nightlife just out the front door. Well maintained and secure underground reserved parking directs you to the freeways that help you explore SoCal. Your living space is very very clean and well-maintained. Good sized kitchen and electronics to tempt you to stay home but you will find yourself going for safe walks whenever you have a few minutes. Wonderful linens. It's all good. The owners are some of the very best on any rental site. You won't believe how thorough and complete the welcome instructions are. Yep, it's a good stay and reasonably priced. Thanks. This apartment was perfect for our long weekend in San Diego... it is in a GREAT location - steps to 5th, which is full of more restaurants than we had meals to have!! We could walk to Petco Park, walk every morning for coffee and walk to dinner which was awesome. We had a rental car and having a parking space was super convenient. The ONLY reason we gave it 4 stars instead of 5 was the bed wasn't the most comfortable for 2 people... but we made it work. Everything else was fantastic so it was still great. Great location! Randy is very responsive whenever we needed to talk to him. We enjoyed our stay very much. The unit is very nice and the location is great. The studio is well equipped, well maintained, everything you need for a great visit to San Diego's gaslamp quarter.